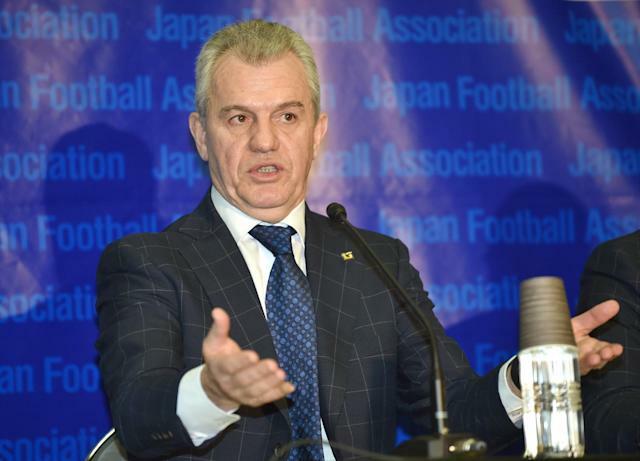 Japan coach Javier Aguirre said the defending Asian Cup champions were never in any real danger despite only narrowly beating Iraq 1-0 in on Friday. Keisuke Honda's first-half penalty proved the difference as Japan, who won a record fourth title in 2011, went three points clear at the top of Group D.
The AC Milan midfielder coolly converted from the spot for the second time in as many games after 23 minutes to give the Blue Samurai a thoroughly deserved victory in front of a crowd of 23,000 in Brisbane. The scoreline flattered the surprise 2007 winners Iraq, who were under immense pressure throughout and could have conceded five or six if the Japanese had brought their shooting boots. "It was a very complicated game because Iraq defended well and we couldn't penetrate," Aguirre told reporters. "We had chances to score more goals and couldn't convert, but we took three points and didn't pick up any injuries so I'm very happy." Japan playmaker Shinji Kagawa had voiced concern about the Brisbane humidity in the build-up to the game, mindful of last year's World Cup flop in similarly sapping conditions in Brazil. "There was some fatigue towards the end," conceded Aguirre, whose side had thrashed Palestine 4-0 in their opening game. "But the players did well. Luckily we got into a nice rhythm early on." Man-of-the-match Honda squandered a string of chances, hitting the framework three times, arguably the most glaring miss when he hit the post in the second half with the goal at his mercy. However, he converted the decisive kick of the game with a well-taken penalty, sending Jalal Hassan the wrong way as he rolled the ball into the goalkeeper's left-hand corner. "I think that I should have scored more, but I created three big chances," said Japan's spiky talisman. "I've got to be happy that we're getting into those positions but of course I should be taking those chances." Japan's movement off the ball was superb, with Honda and Takashi Inui constantly finding space in the centre of the pitch. Kagawa shot across the face of the goal in the 11th minute to set the tone but Japan will need to be more clinical if they are to retain their title with hosts Australia, runners-up four years ago, among several teams in excellent form. Iraq coach Radhi Shenaishil complained his side had suffered from a lack of preparation. "We didn't have enough time to prepare for this tournament," he said. "We did our best to get the players ready, but they haven't reached the level where they can play a full match. "Look at Honda," the Iraqi coach added. "He comes from the Italian league straight here, he's ready. We have players who haven't played since the Gulf Cup (last November)." Japan will be favourites to progress to the quarter-finals with Iraq after the final round of group games against Jordan and Palestine respectively, although all four sides still have a mathematical chance.